If your like me, you go to a lot of baby showers. Sometimes, I want to bring something different! Lets face it, what all new moms really need is DIAPERS!!! However, a package of diapers with a bow on top is just not as cute as a cutesy diaper cake is for a shower! 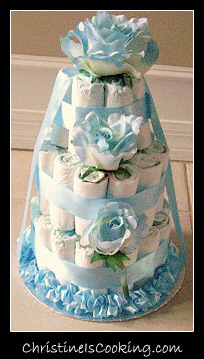 A diaper cake while seemingly expensive and complicated is actually very easy and can be done for around $12 (as opposed to $70+ if you bought one). You can assemble it with disposable or cloth diapers depending on the preference of the mommy to be. Money Saving Tip: If you want to use less diapers. Start your cake off with something large and solid in the middle. For ex: I have put in a bottle of juice for moms that have other older children. 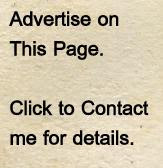 Once you have rolled up several diapers - arrange the diapers vertically in a circle to form a circular base. If you want an extra sturdy cake you can place the layers on cake rounds purchased from a craft store. If you want the outside of the layer to have a smooth frosted look, take your remaining unrolled diapers and layer them overlapping vertically (pure white side showing) around the rolled up diapers. Secure the layer with tightly tied ribbon. Repeat the same as the base layer, but make each tier smaller as a usual wedding cake would look. You can use a few pieces of hidden tape to secure the layers together. I am in no way an artsy person. I am sure those of you who are will have even a better outcome then I did! 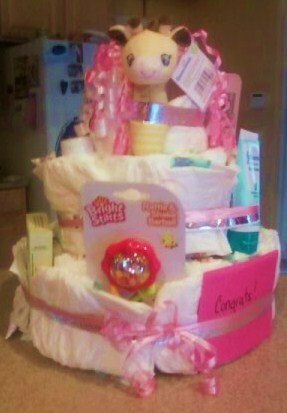 This Diaper cake is a very good one. It has an innovative and creative design and theme. Great work too. Baby Shower program main theme is the Diaper cake which should be a good one so that it ever remain in the minds of the mother and her family.